You go into the store and buy it right? Yes, it could be that simple. But, without proper information, one could end up making a very costly mistake (trust me , I have). So, we will delve into the world of tone and the steps to making a more informed buying decision. Because that’s what you’re looking to find – the right tone. Tone is the combination of your guitar, your amp, and your fingers. The amp is crucial because it provides the means for self expression. This is the first installment of two articles that will try to help you choose an amplifier. I will focus on beginning players today and intermediate players in the next installment. First, what style of music do you play? There aren’t as many amp choices as for guitars, but they are more or less designed for specific groups of players and/or genres of music. This doesn’t mean one amp won’t do most things in the world of tone, but they usually shine in only a few areas. Last, but definitely not least, PRICE!! Some of us can go out a buy whatever our hearts desire, but for the majority of us, price plays a major role in the search for tone. Although I know you want to, as a beginning guitar player, you don’t need to go out and buy that massive Mesa or Marshall stack or even a 2×12 combo amp. Start with something basic. A small practice amp with an 8″, 10″, or 12″ speaker should be sufficient. Channel switching is very nice to have. Channel switching allows you to go from dirty to clean with push of a button on the front panel or with a switch on the floor. Reverb, as well as chorus, is a nice option to have. (Don’t hold your breath for chorus, though.) These features make playing much more fun. I wouldn’t spend more than $300 on an entry-level amp, and that figure should probably end up somewhere between $100 and $200. I don’t recommend buying below $100 dollars. I don’t think they sound all that good. At the sub-$300 price level, pro tone hasn’t entered the building, and tubes are hard to find (there are a few, but we won’t go into that here). Decent noise can be had, though. 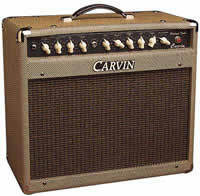 For most tones, the entry level amps of the major manufacturers are great buys. I would stay away from tube amps, because they tend to show more mistakes. This can be very frustrating when just starting out. All that is needed is an amplifier that sounds relatively decent and will keep you playing. As a beginning guitar player, you don’t have to play in the store. Have the sales guy take a particular amplifier through its paces. Listen closely to the amplifier. Is the sound clear? If applicable, how does the reverb sound? Lush and warm or “Boingy”? We want as close to lush and warm as possible. Channel switching? Does it pop when changing the channels? What kind of range do the knobs produce? A large margin of frequency cutting is what we want here, for the purpose of getting as many sounds as possible. (Cheaper amps only have passive tone controls, i.e , they only cut frequencies. The more expensive amplifiers can sometimes have active tone controls, i.e., cutting and boosting of frequencies is possible. The Peavey 5150 II is like this.) Remember that the sales dude has most likely been playing with all these amps for 4 hours a day for several years, and he may sound a lot better than you do, but he also knows the amps. If you do feel up to playing in the store, we need to define some of the terms that you will find labeled on the amplifiers and what some of the jacks on the front do. (Some of the amps in the higher end of this category may have jacks/controls on the back, too.) On the front the amplifier, you will find one or two 1/4″ input jacks labeled input. With two jacks, they are either labeled high and low or 0db and -6db. The high/0db input is for guitars with passive pickups, and the low/-6db is for guitars with active pickups, which have a higher output signal compared to passive pickups. The one, lower input is padded to help control input distortion, which can sound pretty bad. I have found that the only difference is in volume with transistor amps, but your experiences may differ. Next are the controls. The number of controls can vary from one to about twelve, and more have been seen. Generally, you will find a volume control, a bass control, a middle control, and a high control. These are pretty explanatory. Sometimes, the volume control will be labeled post gain. On amps with channel switching, a pre gain control is usually present. This controls the amount of dirt or distortion. If you are lucky enough to get an amplifier that has reverb, there will be a control to adjust the amount of “echo” that you hear, from none to full saturation. With amps that have more than this minimum number of controls and channel switching, a separate set of tone controls are usually added for the clean channel, so that you don’t have to use the same settings on your clean channel that you use for your distortion channel. With chorus, the controls are rate and depth. Rate is the speed of the effect and depth is the amount of the effect you hear. For power, ten to thirty watts is all that is really needed. Anything more, and hearing loss (what? what did you say? ), parents, siblings, and neighbors become a problem. If the amp does have channel switching, I strongly recommend purchasing the footswitch that goes with it. You will thank me. Specific manufacturers to look at are Peavey, Fender, Marshall, Randall, and Waller (this is a new manufacturer that puts out some great sounding amplifiers). If you do have the budget to get an effects box along with the amp, I don’t recommend getting a distortion pedal. Let the amp do the work. Besides, noise problems will usually pop up, especially with transistor amps. In closing, choosing a starter amplifier is more about getting a decent sound that will keep you playing than stroking your ego or looking good in front of your friends with the latest and greatest amplifier on the market. Imitating the tone of your favorite guitar player isn’t necessary, and can even be foolish. If you spend alot of money and don’t keep with it, you have bought your self a very expensive door stop. Remember, purchase what you want and listen to your ears!!! Jeremy Ledford also wrote Beginning the Quest for Tone Part 2 – How To Buy A Guitar Amp. Jeremy Ledford has been playing guitar for 14 years. After just joining his first band recently he is also learning how to build tube amplifiers. Jeremy intends to market a line of boutique amplifiers that will hopefully compete with the major manufacturers.